EDGMONT — Move over, Mr. Ed. There’s a new horse star in town. Mindy Tatz Chernoff of Edgmont was among the 29 speakers at the recent TEDx Talks Wilmington. This year’s prestigious TEDx Talks took place in the Figure 8 Barn at Delaware’s Bellevue State Park. Her horse, Viton, made history by sharing the stage with her. Viton was the first horse, ever, to have the honor. A TEDx Talk event is a showcase for speakers presenting extraordinary, well-formed ideas in under 18 minutes. Since 2009, more than 100,000 people have shared their ideas on TEDx stages in more than 170 countries. Chernoff’s talk, “Love, Connection and a Horse,” explored ways that humans can connect with horses as catalysts for change and transformation. Chernoff should know. The founder of The Resonant Horse, an innovative approach to healing and transformation, Chernoff offers horses to help humans overcome whatever obstacles they are facing that’s holding them back from bringing out the very best in themselves. Chernoff’s rustic barn in Delaware County is Viton’s home. It’s also the location of the many “horse circles” that Chernoff facilitates for men, women, children, teenagers, divorcees, individuals with special needs, those with high stress and anxiety, clients suffering from trauma and abuse and anyone who is feeling less than their usual selves, unmotivated, unhappy, fearful, discontent, feeling unheard or unseen or undergoing a transition with empty nest, divorce, retirement or illness. There are all types of situations where people need change or an uplift and renewed purpose in their lives. Chernoff, an equine specialist, has a dual master’s in spiritual direction and holistic spirituality from Chestnut Hill College and a 56-year background in horses. She grew up in the suburbs of Chicago, entering her first horse show at age 5, garnering second place, and becoming a horse-devotee for life. Chernoff attended Stephens College, earning a degree in family and community studies, with minors in religion and architecture. She uses her skills, aided by five horses, to explore areas of resistance and fear, as well as love, acceptance and compassion. “Horses are inherently nonjudgemental,” Chernoff explained. “They offer us the opportunity to be still in this over-stimulating, hectic world and learn from them. When a person — whether it’s a child, an adult or the CEO of a huge company — is able to quiet down to notice and observe the wisdom of the horse, it can be life-changing. In addition, the non-predatory power of horses offers a superb and safe learning environment with which to feel and heal, Chernoff said. Chernoff’s primary goal in her “horse sessions” is to build upon each individual’s positive traits, encouraging a sense of calm, contentment and freedom to let go. Her sessions vary in length and focus, depending on the needs and desires of the client. The equine specialist holds one-on-one and group sessions and classes, as well as one-day workshops and retreats, on her local horse farm. The encounters with horses require no mounting or riding. Chernoff is currently leading Bodacious Radiance Part II: Horses and Self-Compassion, an eight-week intensive course to bring about change in people’s lives. The group meets one afternoon a week. Chernoff has facilitated workshops for diverse audiences such as unwed teenage mothers and the Archdiocese of Wilmington and at Pendle Hill and at international conferences in Chicago and Orlando. In addition to being a sought-after speaker, the equine specialist offers training workshops for executive and leadership development. Her postgraduate training includes E3A practitioner, Eponaquest apprentice, mindfulness training and executive leadership training. This was the second TEDx Talk that Chernoff and Viton delivered. Their first was in 2016 and received close to 11,000 views after the video was posted online. The current TEDx Talk video will be available for viewing on the TEDx Talks YouTube channel at the end of October. In addition to leading horse-human help sessions, Chernoff is the author of an Amazon No. 1 new release, “From Muck to Magnificence: How Cleaning Horse Stalls Can Lead to an Astonishing Life.” The book tells the story of how Chernoff’s own relationship with horses changed her life and, in turn, made her devote her life to helping others with the aid of her horses. 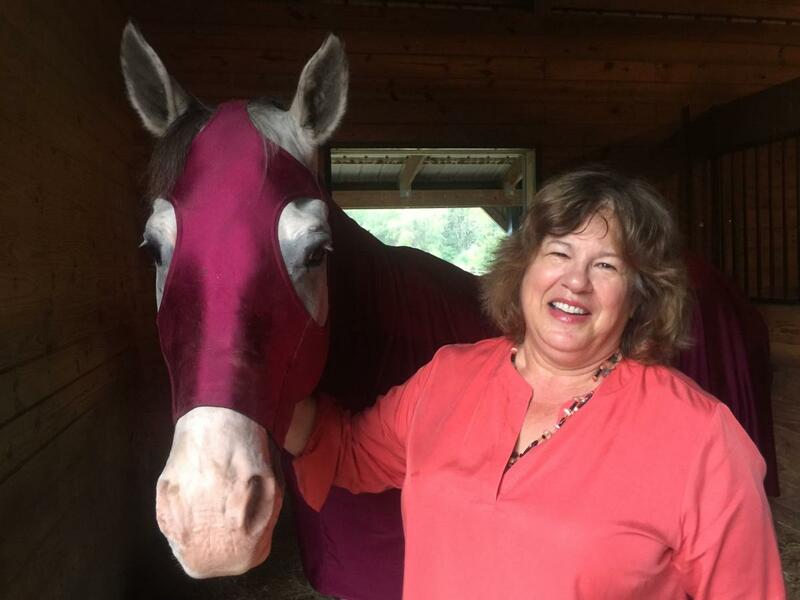 Through her own experiences, Chernoff teaches readers how to connect with horses to improve relationships and other aspects of their lives. At the end of the TEDx Talk, Chernoff and her prized horse wowed the audience with a stunt that took her nine months to perfect with Viton back at their Delco barn. She asked him, in front of the large audience assembled at talk, to sit on a beanbag chair. Viton stunned hundreds of viewers by complying. For a horse to take a sitting position is an extreme oddity because it puts them in a vulnerable position, Chernoff explained. Non-predatory animals, like horses, are uncomfortable in such positions unless their trust factor is extremely high. For more information on TEDx Talks Wilmington, visit tedxwilmington.com. For more information about upcoming events hosted by Chernoff, visit theresonanthorse.com, email theresonanthorse@gmail.com or call 610-247-0408.